Works with 2.7V/3.3V/5.0V logic systems, 4bit/8bit/16bit/32bit micro-controllers. it EVEN works stand-alone. 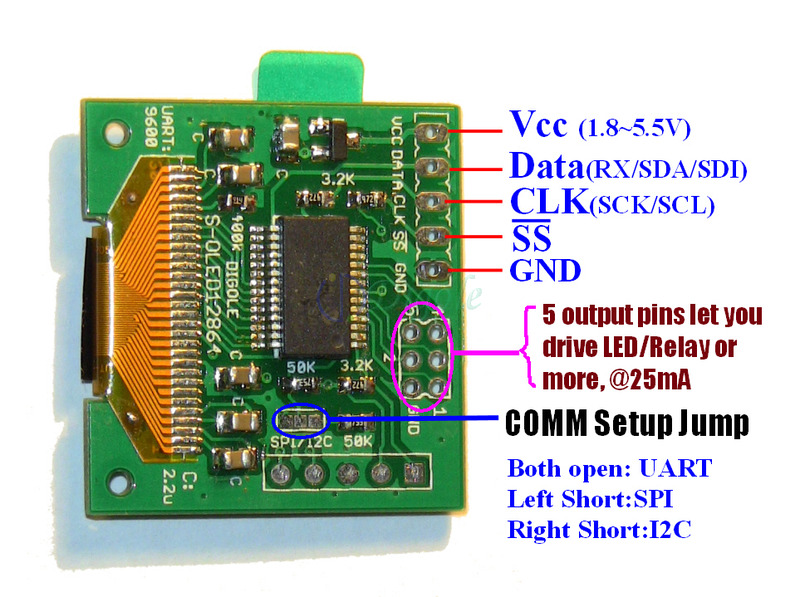 Support serial (Hardware or Software): UART, I2C and SPI, set by the jumpers on PCB, support all four SPI mo. 7 fonts and graphic engine embedded, touch screen and flash chip drivers embedded(if touch screen or 2 to 16MB flash chip installed), custom fonts can be downloaded to the module's flash. Firmware upgrade-able and custom-able: http://www.digole.com/fw. Program manual, sample code and library for multiple platform. Multiple online tools to make custom fonts, convert images and more, accelerate product development. UART baud (bps): 300, 1200, 2400, 4800, 9600, 14400, 19200, 28800, 38400, 57600, 115200, 203400, 406800. These terms relate to the driving method of the OLED display. 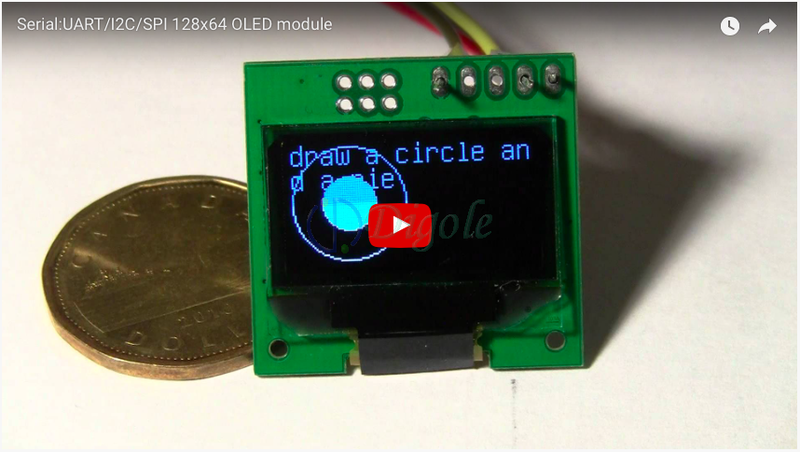 A PMOLED (Passive-Matrix OLED) is limited in size and resolution, but is cheaper and easier to make than an AMOLED (which uses an Active-Matrix). An AMOLED uses an active-matrix TFT array and storage capacitors. While these displays are more efficient and can be made large, they are also more complicated to make. PMOLED displays are used in mp3 players or secondary displays on cell phones while AMOLEDs are used in smartphone displays, digital cameras and TVs. * "DM":"C/!/~/&/|/^"(ASCII 1byte) -- set drawing mode--C="Copy",! and ~ = "Not", & = "And", | = "Or", ^ = "Xor"
Click "Shipping and payments" page, select the correct country, then click "Get Rates", you will see the estimated delivery days. The delivery time are different season to season, the eBay mantain it automatically. Same way money refund as you paid. Replacement or money refund are available upon buyer request. Please contact us using ebay message system in advance before leaving feedback if there were any problem with your items. Payment is expected within 4 days, Ebay Unpaid Item Assistant will open unpaid item case automatically if no payment received in 4 days. Q: How do you caculate the combine shipping cost? Q: What can you do if my address is not correct? A: Buyer should take all responsibility for offering incorrect information. Copyright Digole Digital Solutions, 2008-2019. All rights reserved.